Emergency Chiropractic Home Visits will be done up to 50km from Mitcham (which all Eastern Suburbs of Melbourne and inner Melbourne and some of southeast Melbourne suburbs and some other areas around Melbourne). Call 0398737373 or if out of hours call Dr David Jones (Chiro) on 0409566374. When you are booking an Emergency Home Visit with Better Backs, the chiropractor or receptionist will take some of the history of what has happened over the phone and give some any relevant advice. A time will be made for your appointment and the chiropractor will bring his equipment. During the home visit appointment as much history and assessment will be taken and then appropriate treatment performed. Treatments that are commonly used are cold laser, dry needling massage, Activator (adjusting instrument) or manual adjustments. Usually some follow up is needed the day after treatment at one of our clinics in either Mitcham or Richmond but another home visit can be done if needed depending on severity. This cost $190 for a new patient provided they are within 15km of Mitcham or Richmond an extra fee will be added for traveling outside this distance.Existing Clients would expect about $120 and traveling fees if living outside the 15km radius. Scheduled (non emergency) home visits for chiropractic are usually done for those who are unable to be transported easily to the clinic. These are most easily done on a Friday between 12:30pm-3:30pm or Monday between 12pm-4pm and are often done for those who are unable to be easily brought to the clinic. Scheduled home visit for Massage appointments are also available with Simon Gunn one of our Remedial massage therapist from our Mitcham office. Cost $120 plus travel if more than 15km. Ask about travel cost when booking. 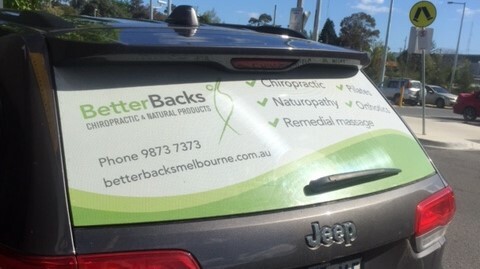 If you are able to attend the clinic during our normal shift, and can not wait till our next shift, Better Backs Chiropractic offers out of hours visits. Initial patients $150, existing patients $100 unless between 11:30pm and 6am then $200.